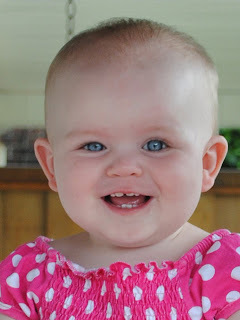 Using some of TCM's Essentials Jr. summer programming as a guideline, I have appointed myself Grand Poobah of my newly-minted (August 16, 2010) niece Lenny's introduction to classic film. It is never too early to begin opening your mind to the riches of entertainment and art available to us. Lenny, be warned, Caftan Aunt is about to go total movie geek on you in a way you haven't seen yet! This week TCM has scheduled the perfection that is 1939s Stagecoach. Why is it perfect? Number one, it is directed by John Ford. Number two, it is a western. Number three, it is a western directed by John Ford. Storytellers are often told, "show, don't tell". Storytellers, particularly cinematic storytellers, sometimes find this rule a challenge. John Ford was not one of them. With an artist's eye, he knew where to put the camera to fill the screen with images of people and surroundings that create beauty of frame and enhance our emotional response to characters and situations. Stagecoach is a movie filled with drama, humour, adventure, and romance. It is a story of many characters facing their individual problems and their combined danger on a trip through wild western territory. This movie is an expanded adaption by Dudley Nichols of Ernest Haycox's story Stage to Lordsburg. Screenwriter Nichols and director Ford collaborated on 16 movies. They understood each other's sensibilities and story goals. John Ford would bring his audience into a society fully formed and through a bit of dialogue or business introduce us to characters and let us make of them what we will. An example in Stagecoach would be of the gambler Hatfield played by John Carradine. His actions and words, both bold and evasive, tell us about his character and hint at his background. We round out his life from our imaginations and those clues. John Ford was a director who displayed a fond understanding of the characters in his films, and a respect for their triumphs. He sometimes told the stories of great accomplishments, but his deepest admiration seems to me to be for those who never give up the struggle of the every day and are sometimes allowed a victory. In your life, Lenny, you will know both struggles and victories. You share this with all humanity. Lenny, you should know that you come from a family with a strong Fordian background going back to your great-grandfather. When you grow up and go to film school they will try to turn you into a Kubrickian. Don't you let them! Number four, the Duke. Right there with Welles as Harry Lime for best screen entrance. He's really electric in Stagecoach! By the way, a little bit of further trivia on the original story--Stage to Lordsburg originally appeared in the April 10, 1937 issue of Collier's Magazine if anyone is seeking it out. I've sold nice copies on the magazine side of the business before in the $30-$40 range (no, none in stock at the moment). A good bit of advice for Lenny on a great movie. Stagecoach was, in my opinion, way ahead of its time. It allowed the individual stories of the characters to be told, at once independent and also intertwined with everyone else. And John Wayne in a slightly tarnished character, much like James Stewart in Winchester '73. Caftan Woman, I am so sorry I haven't been around to keep up on your posts. Weird month, so much going on, but it's coming to an end. I will be back to read your wonderful stuff. "Lenny, you should know that you come from a family with a strong Fordian background going back to your great-grandfather. When you grow up and go to film school, they will try to turn you into a Kubrickian. Don't you let them!" Allen, I hadn't looked at Ringo and his similarities to Stewart's 50s western persona. 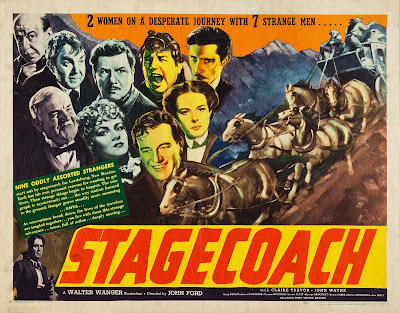 "Stagecoach" is continually intriguing. Becky, I look forward to your comments whenever you have the time, and whenever one of these posts strikes your interest. I hope you get some quiet time to yourself soon. Jacqueline, I thought you would!